In 1953, René Magritte completed one of his major masterpieces, Golconda. Referring to a wealthy city in India, the name and the painting draws inspiration from the desire of wealth. The Belgian painter used his very common image of nearly identical men in long coal colored trench coats and derby hats. The surreal painting draws the viewer into a realm of uncertainty, as he depicts images of men that are unusual. The oil on canvas painting was created from a surrealist point of view. The viewer is surprised by the images of men seeming to have buoyant qualities. René Magritte displayed his ability to use realistic images in a variety of unique ways. The repetition of almost identical men painted with solid oil paint, are strategically placed in front of an almost architectural style building. The bare bones white of the large structures in the background and their crimson red roofs show Magritte’s sense of representing the ordinary. The sky, in pale blue, illuminates off of the canvas as the well-dressed men appear to magically ascend through the painting. Even though the men appear to be akin, through further investigation the viewer notices that some of the faces are in fact different. 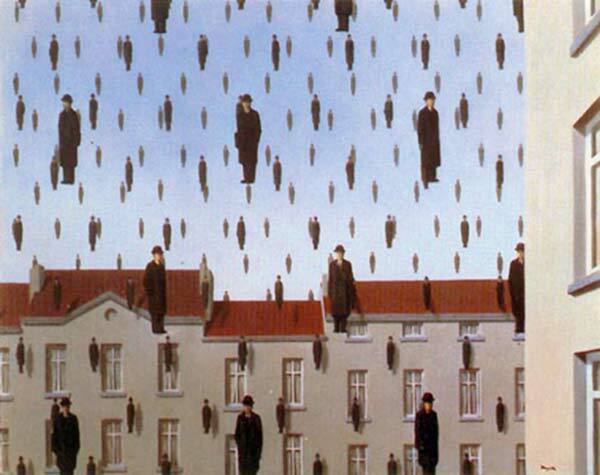 Magritte himself claims one of the faces and he pays homage to his poet friend by using his image as well. Although Golconda is a vision of surrealism, its strong images create a very real effect. One has to question the reason why these men would be placed in such an unusual manner. Magritte’s reasoning is partly due to his view of representing people and objects that show how reality can be defined by how one looks at it. The oil on canvas painting is light hearted, but does not disappoint the inquisitive viewer. The technical skill, mixed with surrealist opinion, makes for a piece of outstanding art.